Become an Earth First! News Correspondent! With actions against eco-destruction popping off like crazy across the US and Canada and solidarity being shown across the world, from the Tarsands Blockade, to Uni’sto’ten resistance to the Pacific Trail’s Pipeline, to the amazing movement we are seeing with Idle No More, we want to know what you all are doing at the grassroots level. Folks down at the Keystone XL blockade in Texas are already flashing their Earth First! 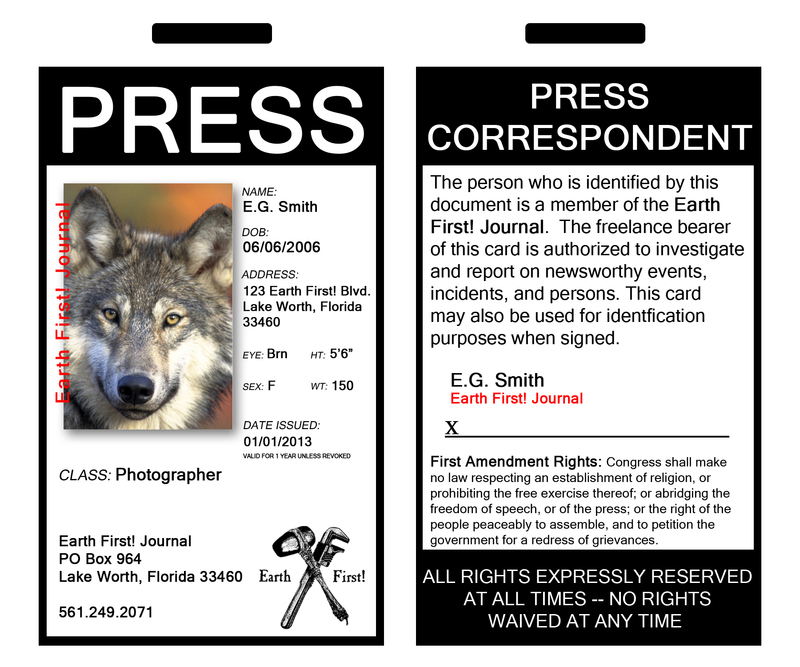 press passes and taking on their own independent media better than any corporate-sponsored news agency can. With thousands of online readers and a quarterly print publication, Earth First! Journal is always looking for correspondents. Highlight what is happening with your local campaigns and solidarity actions. Show the world that we are all a part of the ecological resistance movement. No compromise in defense of the Earth! Email us your action news, articles, essays, videos, photos, music, and more, at collective@earthfirstjournal.org.